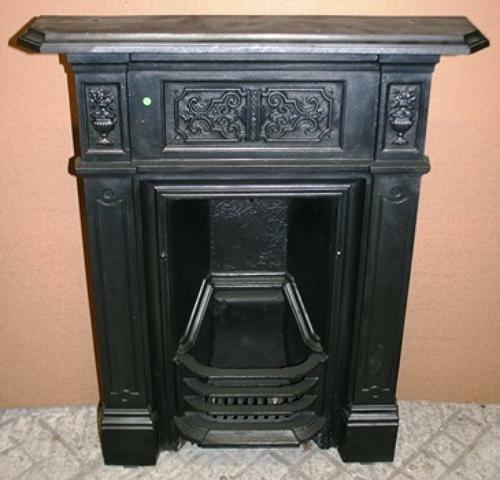 A very pretty, petite, late Victorian cast iron combination fire with ornate design. The fire has Adams Style urns and a decorative central panel. The fire has an RD number (RD266686) dating the fire to 1895. The legs have a linear design and the front bars are attractive. The fire has smoke flap and grill. The fire is of a petite size and would be perfect for a bedroom or small dining or living room. The iron is in good, reclaimed, condition and has been blacked and polished, giving the fire a lovely rich colour. The fire does have some slight signs of use and wear, as expected of reclaimed items. There are some small scratches and casting marks and there are is a small chip to the concrete back. The fixing lugs have broken off and this has left some damage to either side of the fire. We can repair the fire and replace the lugs for an extra £40 or the fire can be drilled and screwed to the wall by purchaser. The back has some surface rust, but the fire has a fantastic, classic, design that would work well with most interiors and would provide great style and character to a home.